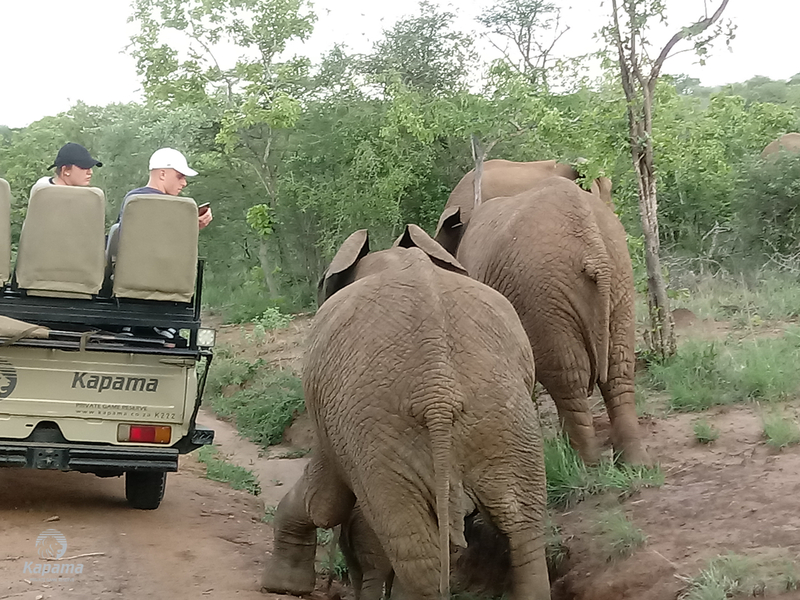 An Elephant Parade | Luxury Safari Experts | African Safari Co.
After enjoying a delightful High Tea, we headed out from Buffalo Camp for the afternoon safari drive. The plan was to look for a Leopard, one of the most elusive of the Big Five, as that was the only animal my guests had not yet seen. However, as usual the bush is always full of surprises. While we were meticulously searching for any signs of this beautiful cat, we happened to stumbled upon a large herd of Elephants. Elephants had been on top of my guests bucket list, so they were absolutely thrilled to come across another herd of these gentle giants. We decided to stop our game vehicle and spend some time with them as they went about their business. They has a small calf with them which made the sighting even more enjoyable. We sat and watched as they slowly made their way up the road. They came to a small ridge that they needed to cross over to continue with their march. A few of the older and bigger Elephants causally and gracefully stepped up over ridge with ease and agility. Then it was the little Elephant’s turn. It came to the ridge, ready to take on the challenge but found it slightly more difficult than anticipated. We watched as the young calf tried its best to figure out the best way to get up. That is when we were blessed with a very special surprise. 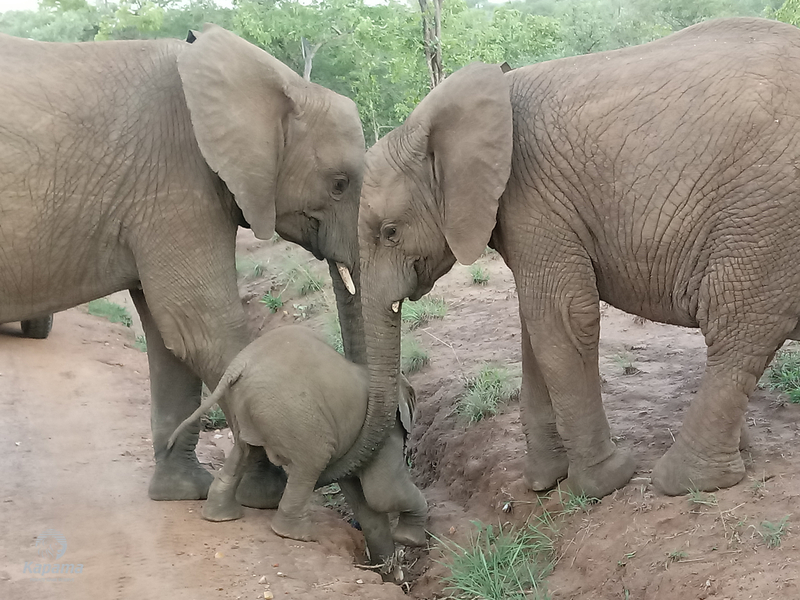 We all watched as not just one, but two of the bigger Elephants, sensing the distress of the young calf, came to its rescue. Instinctively the trunk of the older giant wrapped itself around the young Elephant to help it up. Soon enough, with help from the rest of the herd, the young Elephant was on top of the ridge. Elephants are one of the most intelligent mammals with a very good memory. It is one of those creatures that you could spent the whole day watching and laughing with them as they always seem to have something to do. Unlike some cats that spend the whole day sleeping. The Elephants just made our afternoon one of the best possible sightings and drew everyone’s attention. We all actually forgot that we were on a mission to look for our elusive Leopard. 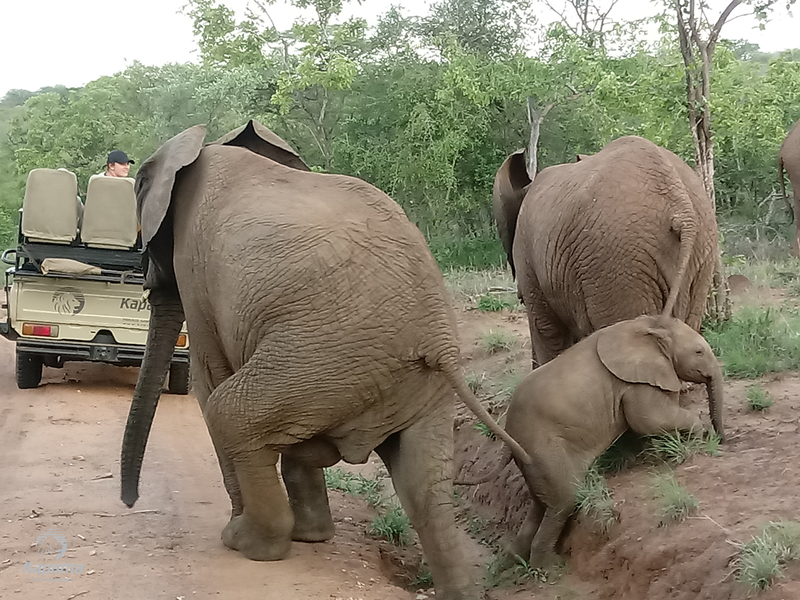 It was a wonderful moment for my guests to witness and so close to the road. The soft chatter and energy of their excitement could be felt all the way in the front. 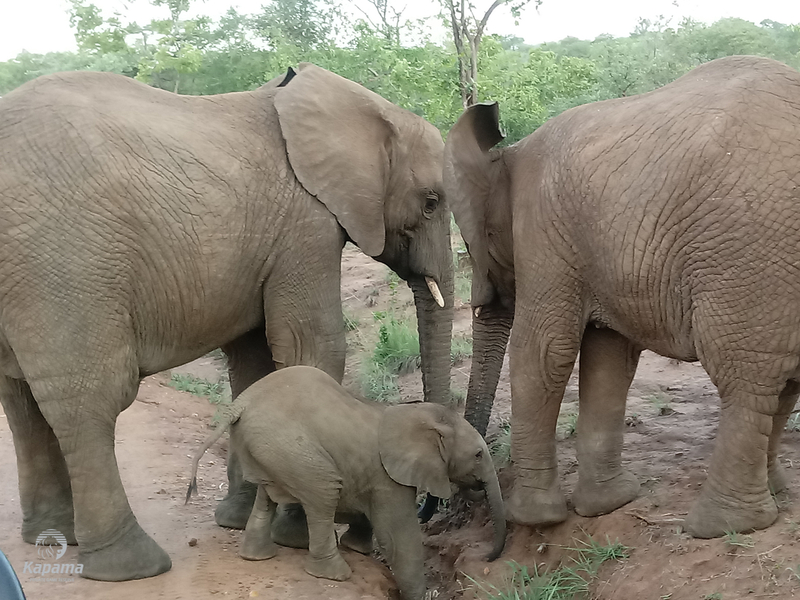 As I was slowly pulling out of the Elephants sighting my guests kept asking if we could wait and watch longer. 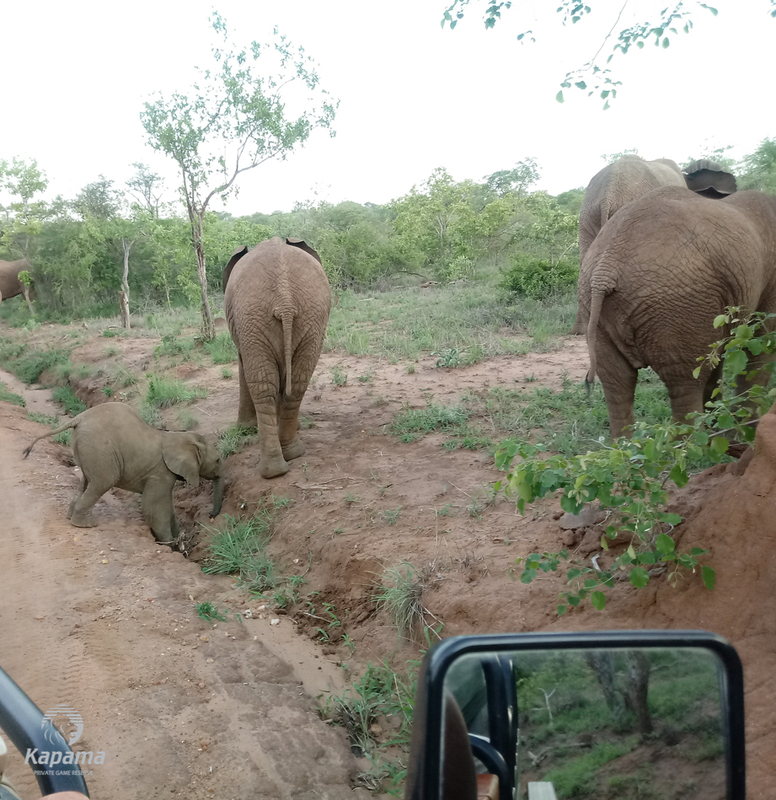 It just shows that it doesn’t really matter how many times you see the same species while out on a game drive, they might be doing something that you have never seen before. That is what makes working in bush and being surrounded by nature on a daily basis such a privilege. Nature always makes sure there are plenty of surprises for us to enjoy.